This past weekend, we were in Connecticut attending my granddaughter, Megan’s, play. She is in the 6th grade and the kids put on “Cinderella”. They did a fabulous job, really excellent and wonderfully enjoyable from the acting and the songs, to the sets and the costumes; terrific job. But I also realized something else: in the Cinderella story, Cinderella, though poor and treated badly by her step mother and sisters, always is kind and obedient toward them. She deflects their injustices toward her with acceptance. She is Christ-like in her attitude toward them, turning the other cheek. She is not resentful toward them, nor vengeful. She continues to express hope in the goodness that will come and her only reaction to more drudgery and work is a sigh, not an unkind word. Because she sees the world in this different light, she can sing joyfully from her poor condition, and shine like a princess when it is time for the ball. It is no surprise that the Prince sees something special in this girl because she brings a light into the room with her goodness. I wonder sometimes at the cynicism of the worldly, those who are sophisticated and far from naïve. 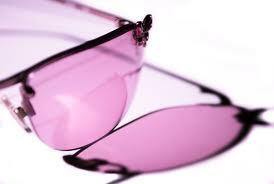 They think that those who see the world in “rose-colored glasses” are in for trouble. But Christ called us to be as little children, to see the world with fresh eyes. Two weeks ago, when I had the cataract in my left eye removed, I could not believe how beautiful the world looked, how vivid and full of color and detail. I could suddenly see the freckles on a friend’s face, the individual needles on the pine trees in our back yard, and the beautiful purples and blues that folks were wearing. I also spent the first week after surgery scouring my house, seeing dirt and tiny tot fingerprints that I hadn’t noticed before now. But I was happy to do it. While cleaning I thought of my toddler grandchildren, the ones who still need to hold onto the wall as they descend the stairs. They bring me joy and it is because of them I live where I do. Thinking about this new view of the world, I remembered holding my first grandchild when she was about 8 months old, taking her into her backyard and walking from tree to bush to flower, to show her up close all the glory that was out there. I remember her little hands reaching out to touch the bark of a tree for the first time. The joy it gave me, to be privileged to be her Nana, on this beautiful mid-summer day, holding her and seeing the world through her eyes. Reflection: What would Cinderella suggest to you to see in a different light? What is the “cataract” in your own eye? Beverly Bernard is a retiree, living in Swanzey, NH. So glad your cataract surgery was marvelously successful. Thanks for sharing your Cinderella insights and the wonder you introduced to your grandchild early on in life--heart warming, with deep truths worth highlighting. Thank you, Liese. It is interesting and provocative to find Christ's message in the ordinary things of life. So much of the time we go through life half asleep and then sometimes we have these astonishing moments of clarity and we feel fully awake for the first time in years. Thank you again, for your good thoughts.